An elemental Earth stone, Jasper’s frequency is slow and constant, aligned with the electromagnetic energies of the planet. It enables one to be more present in the physical body and conscious of Nature and one’s surroundings. It encourages one to celebrate moments of isolation to absorb, reflect, and connect with these energies and en kindles an awareness of the spiritual connection we hold with all living things. Known as the “Supreme Nurturer,” Jasper is a stone of grounding and stability, providing comfort and security, strength and healing. Its presence balances the aura to a level of wholeness and peace, and acts as a reminder that one is not here on the physical plane simply for oneself, but to bring joy and substance to others. Jasper is traceable to all ancient peoples and civilizations. It was considered sacred and a powerful protection stone, for both the physical world and in the spiritual realm. Amulets of Jasper were carved by the Egyptians with symbols. It was highly utilized in many cultures for engraving cylinder seals, signet rings, and special talismans depicting astrological and religious images. Jasper is a dense, opaque, microcrystalline variety of Quartz. Fibrous and grainy varieties of Quartz are often grouped together and referred to as Chalcedony, though Jasper’s microcrystals are laid out in large, sugar-like grains rather than the fibrous layers of Chalcedony or Agate. It occurs in nodules or as fillings in fissures and may be found all over the world, in nearly every color. 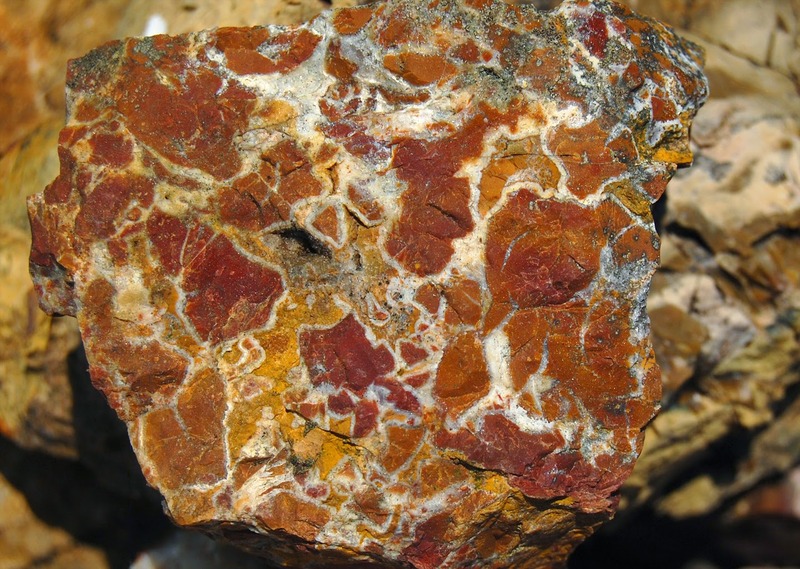 Jasper is colored by oxides of iron and known for its deep earthy tones of red, yellow, brown and green, sometimes in shades of blue or purple, and displays wonderful contrasts in its banding, inclusions, “pictures,” and small circular patterns. Its name is derived from the Greek iaspis, meaning “agate,” the Assyrian ashpu, and the Hebrew jashpeh. Black Jasper, or Basanite, is a flinty form, one of the rarer Jaspers. It empowers supreme physical and mental efforts, and is highly shielding against curses, threats, and danger in high risk occupations. In polished form, it is an excellent scrying stone for discerning what is hidden. 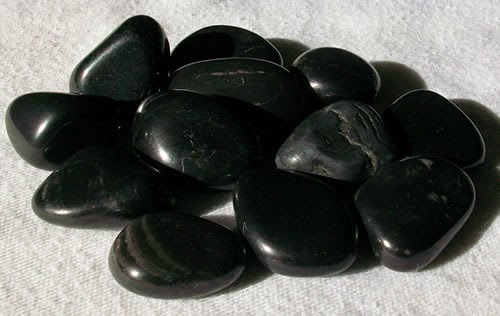 Black Jasper has the ability to take one deep into an altered state of consciousness, and facilitates prophetic dreams and visions. 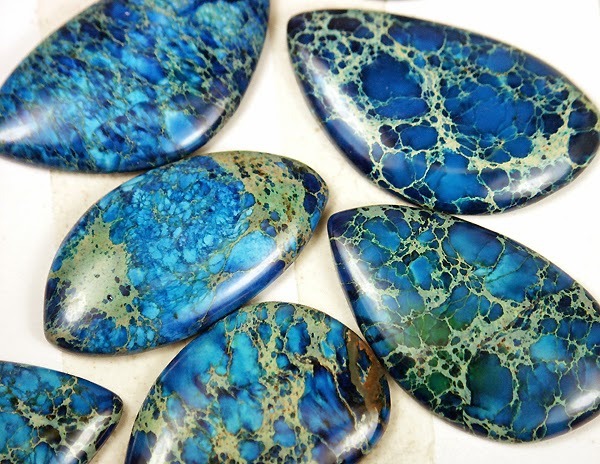 Blue Jasper forms in various shades of blue, often swirled with dark patches or veining, and is sometimes artificially treated to enhance the color. Linked with nobility of spirit and purpose, it imparts the courage to speak out against injustice and to risk unpopularity to defend the vulnerable. It is the perfect anti-stress stone for those in charge of others’ well-being, and for older children and teenagers to carry to resist being led into unwise behavior or risky situations. Brown Jasper ranges from deep chocolate brown, gold- to reddish-brown, to tan or ivory, and is characterized by artful banding, flow patterns and veining. It includes some specific formations such as Picture Jasper, Bruneau Jasper, and Bat Cave Jasper. Brown Jasper is connected to the Earth and encourages a deep ecological awareness. It brings stability and balance, and is particularly grounding as a worry stone, or for dissolving a sudden rush of fear, anger, or panic. It facilitates deep meditation and centering, and grants access to past lives for karmic healing. 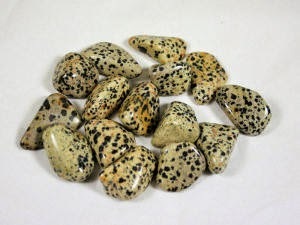 Dalmatian Jasper is pale gray, cream or beige-brown with dark spots and resembles the coat of a Dalmatian. It is a protective and healing stone, fortifying the spirit and encouraging a sense of playfulness. It counters disillusionment, cynicism and skepticism, strengthens family bonds and long-term friendships, and has a calming influence for children and animals. Green Jasper, though a component of many of the multi-colored Jaspers, is most rare and prized when it forms as a single green color. It ranges from pale spring green to a deep tea or olive green, and has been revered since antiquity for its powers to soothe the spirit, banish ghosts and evil thoughts, increase fertility, and bring in rain. Green Jasper also balances obsessive tendencies and restores harmony to the emotional body, allowing one to gain control over thoughts. It is the ultimate sleep stone. 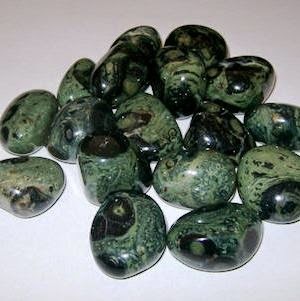 Kambaba Jasper, sometimes called Green Stromatolite Jasper, contains swirls and orbs of deep green and black; one of the more exotic Jaspers. It contains the earliest records of life on Earth, fossilized algae and other primeval microorganisms, and is a marvelous stone for bringing peace and tranquility to troubled minds. It strengthens those whose hearts have been deeply hurt, and provides grounding and protection in ancient places when tuning in to the people who once lived there. Leopardskin Jasper is Orbicular Jasper, usually in dominant shades of green or orange, with dark leopard-like banding and glassy inclusions. It reflects the duality between dark and light, teaching one to recognize dark as a complement to light rather than the opposite. This is a shamanic shape-shifter’s stone, helpful in journeying and getting in touch with one’s power animal. Leopardskin also strengthens the sense of self, attracting the right energies into one’s life to heal and move beyond past traumas, while being guided to new opportunities. Ocean Jasper, also called Sea Jasper, is rare Orbicular Jasper collected from the remote shores of northwestern Madagascar and can only be mined at low tide; it is sometimes referred to as The Atlantis Stone. 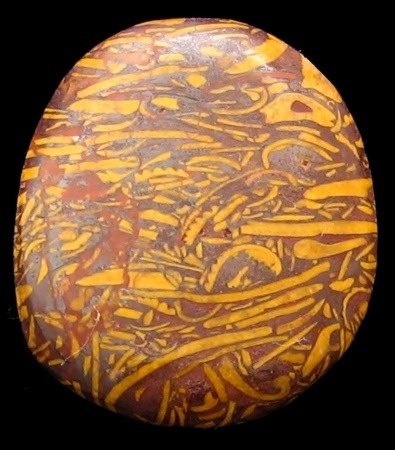 Its multi-colored circles, contour lines, and bands of opaque stone are interspersed with druse, and spiritually represent the interconnectedness of all things. It carries a gentle nurturing energy that, when used regularly, assists in developing self-love and empathy for others. Its orbicular pattern facilitates circular breathing and enhances meditation. 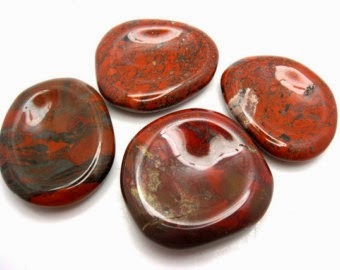 Ocean Jasper may be used to connect to Atlantis and unlock the mystic knowledge held within the stone. Orbicular Jasper describes several varieties of Jasper displaying perfect circles throughout the stone that create its focal point, and usually its dominant color. Its flow of energy is steady, and encourages patience and the acceptance of responsibility. A helpful stone for getting things done, it is particularly conducive to pursuits based on service. The circular markings resonate with circular breathing and make a wonderful transition aid in meditation. 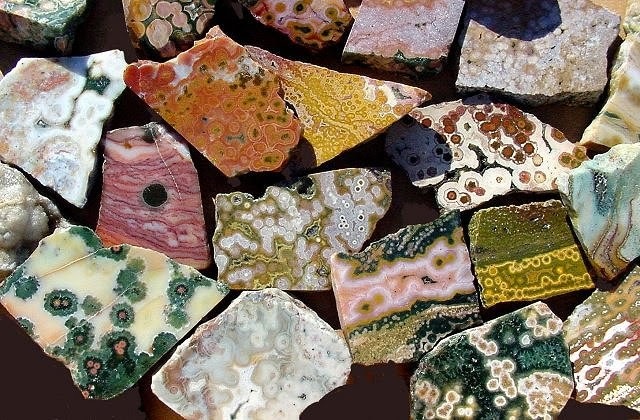 Orbicular patterns are most prominent in Ocean or Sea Jasper, Leopardskin Jasper, and Poppy Jasper. Picture Jasper is said to be the Earth Mother speaking to her children. It forms in remarkable bands and flow patterns of browns, black, tan, blue and ivory, and exhibits a hidden message or “picture” from the past. It is marvelous for inner journeying to sacred sites and ancient civilizations, and for connecting with Earth’s consciousness. An excellent stone for creative vision, initiative and boosting confidence, it is an ideal aid for starting one’s own business. Wear for long periods of time to bring hidden thoughts, grief, fears, and hopes to the surface for examination. 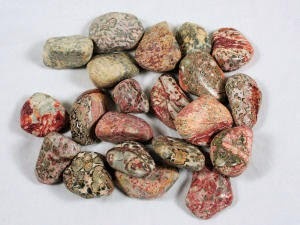 Poppy Jasper is a variation of Brecciated Jasper characterized by orbicular patterns of bright red “poppies” amid mottled shades of brown, black, yellow or white. A joyful stone associated with poppies and remembrance, Poppy Jasper brings cheerfulness and vitality, reminding humanity to help one another. This stone can be gently stimulating, or fiery in passion and intensity as needed. It provides the impetus for variety and new experiences, and encourages the development of fresh ideas. Rainforest Jasper is opaque Jasper in dominant shades of moss green and white, swirled with veins of earthy hues. It is a stone of connection to the Earth and living things, and honors the highest spiritual teachings from Nature. It awakens a sense of joy at life’s simplicity, and carries a healing, invigorating energy of hope and renewal. It is a marvelous stone for Earth-healing and working with the devic realm, and may also be used in retrieving knowledge of herbal-healing from the far past, especially wisdom passed through one’s ancestral matriarchs. Royal Plume Jasper, also called Purple Jasper or Plum Jasper, forms in shades of purple with plume-like markings. 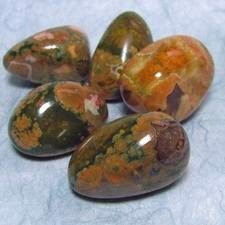 This is a noble Jasper of spiritual wisdom and is conducive to working with archangels or deity figures from different cultures. It also makes a great power stone for studying a formal spiritual path, healing tradition, or training for medium ship. 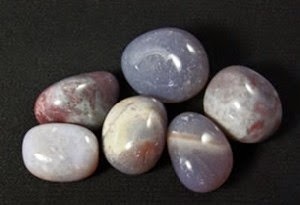 Stimulating the Crown Chakra, this stone creates an aura of wisdom and authority, and can enhance one’s status and power. It assists in preserving one’s dignity, and helps reduce contradictions that make decision-making or clear action difficult. It calms the emotional body, increases memory skills, and has the ability to focus multiple energies together for a single purpose. 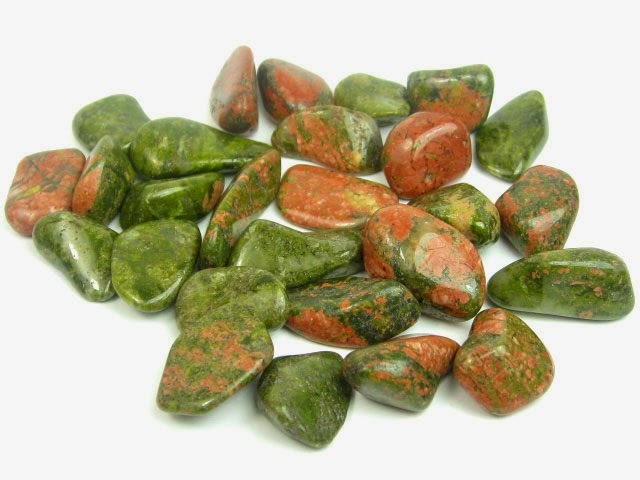 Unakite Jasper is a combination of Red Jasper and Epidote solidly bound together, and is the crystal of harmonious relationships. Its pink and green colors balance aspects of the heart, lifts spirits when one is down, and helps to release deep-seated emotions in a slow and gentle way. It promotes patience and persistence, and gradually eliminates bad habits and the thoughts and patterns that perpetuate them. It is a great stone for children’s sensitive emotions, and is particularly good for helping them bounce back from sorrow, grief or disappointment. This stone is wonderful for anyone who feels a little lost, overwhelmed, or has trouble focusing on the here and now. Yellow Jasper is mustard, sandy or burnished yellow with subtle flow patterns or veining. It is a stone of endurance, perseverance and tenacity, and shields against others’ negativity. Worn for long periods of time, it eases chronic worries and builds self-confidence, attracting others for friendship or to help with a goal. It supports steady learning, and transmits healing and empowering Earth energies, especially when meditating outdoors. Jasper is superb for healing and sustaining the physical and emotional bodies during injury, prolonged illness or hospitalization. Its Earth energies bring gradual strength and renewed vitality, while helping one to understand and endure these frustrating or painful experiences. Jasper makes an excellent diet stone, lending emotional support and strength in self-discipline, as well as boosting physical energy levels. Its slow, steady vibration helps avoid extremes and encourages perseverance. It is also useful for long periods of fasting. Jasper is a remarkable talisman for cutting down or quitting smoking, and may assist in reducing one’s over-consumption of alcohol. It removes harmful toxins from the system over time, and helps release the emotional triggers that perpetuate the behavior. This stone may be used to align the energies of the chakras to facilitate safe astral travel, particularly when placed over the Heart and Navel Chakras. It is highly protective and grounding, and may also be used to promote dream recall. 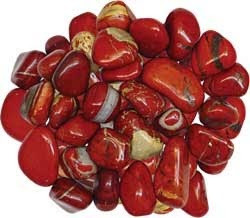 Jasper is believed to increase fertility and is conducive to happy pregnancies. It is a powerful aphrodisiac and a re generator of sperm, especially when it is combined with Garnet or Topaz. Jasper is considered highly restorative for tissue deterioration of the internal organs, and useful in treating disorders of the kidneys, spleen, bladder, liver and stomach. It may also aid in balancing mineral content and regulating supplies of iron, sulfur, zinc, and manganese within the body. Jasper water is soothing for the digestive system, and is particularly useful as a gem elixir because it does not over stimulate the body. It may be made by the indirect method, or by letting the stone soak in demineralized water overnight. 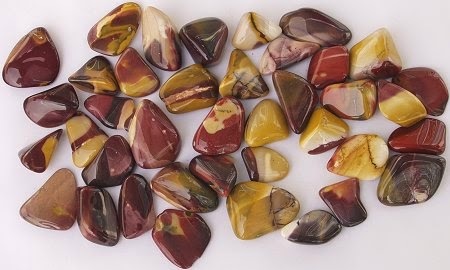 Jasper is beneficial in staunching blood flow, particularly nosebleeds, and also assists in reducing hemorrhoids. It soothes epilepsy and gout, and may be used to treat the sensory loss of smell. A stone of courage, Jasper imparts determination and tenacity in all pursuits. It encourages one to be honest with oneself when confronting problems, and helps one recognize and overcome insecurities, fears and guilt. It inspires moving forward assertively, rather than aggressively, and acts as a reminder to work harmoniously with others. Place any Jasper on the Base Chakra to stabilize and energize the physical body. Laying it over each chakra in turn, will cleanse, boost and realign the chakras and aura, balancing yin and yang energies as well as aligning the physical, emotional and mental bodies with the etheric realm. 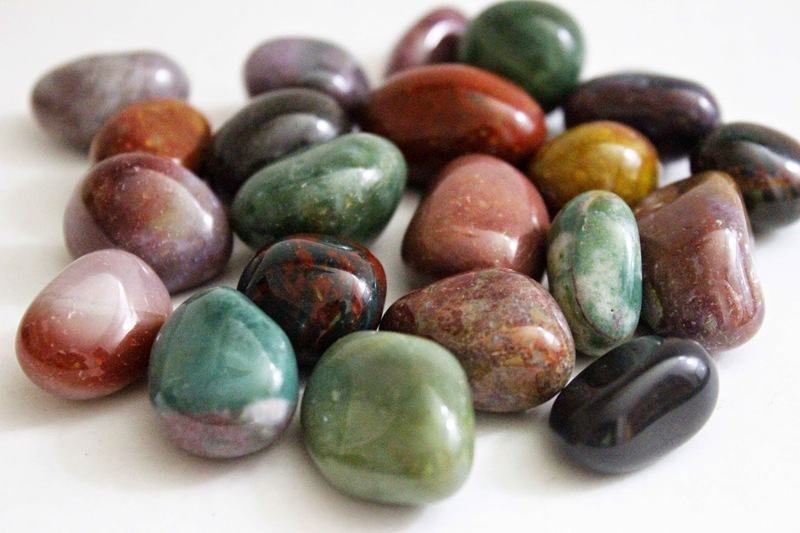 With Jasper’s diverse range of colors, it is marvelous for use in body layouts, and individual colors should be placed appropriately for specific chakra healing. Jasper strengthens one’s connection to the Earth and the spiritual wisdom and sacredness of life that exists in nature. It encourages one to celebrate moments of beauty in the ordinary and the extraordinary, and to find harmony within the self, and with others. 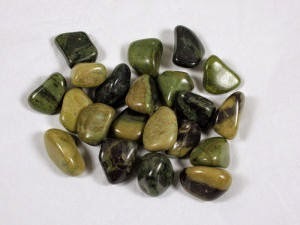 Through meditation and dream work, Jasper can provide a connection with Earth’s ancient past and allows one to retrieve spiritual knowledge for use in the present to help heal humanity and the planet.